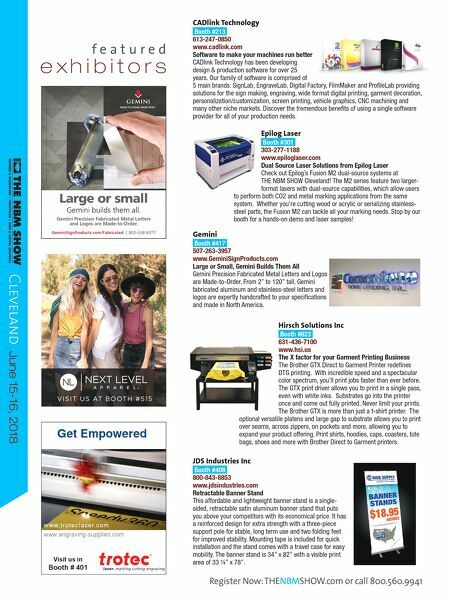 Cleveland June 15-16, 2018 OJNSJNUJbmfildJk_jJëÜçïéêÉîáÉïJ`ibsbi^kaKéÇÑ===N===QLNPLOMNU===QWPRWRO=mj Make Booth #317 Your First Stop. Quality & Leadership give your business a competitive advantage! f e a t u r e d e x h i b i t o r s Universal Laser Systems Booth #317 480-483-1214 www.ulsinc.com PLS4.75 System with 9.3µm CO2 Laser – Only at ULS You will only find the advanced 9.3µm laser at Universal— compatible with all ULS platforms including the PLS4.75. Available in 30, 50 and 75 watts, the 9.3µm laser offers intricate details and cleaner cuts on wood, leather, plastic and more. It also completely eliminates weeding on many Siser ® and Stahls' ® heat-transfer materials for fabrics. Plus, ULS modular architecture and Rapid Reconfiguration ™ offer users a 30-second swap of the industry- standard 10.6µm to the 9.3µm laser in any system. Come see us for a live demonstration! Trotec Laser Booth #401 866-226-8505 www.troteclaser.com Empower Yourself with a Trotec Laser Whether you are starting your own business, or looking to grow an existing business, Trotec can empower you with the capabilities, materials and support you need. The company's versatile CO2 and fiber flatbed lasers can cut, mark and engrave a broad range of materials at processing speeds up to 140 inches/sec., making them the fastest on the market. Combined with its new line of competitively priced engraving materials and expert support directly from the manufacturer, Trotec has everything you need to grow a business. See how Trotec can empower you. Next Level Apparel Booth #515 310-631-4955 www.nextlevelapparel.com The New Made in the USA Line by Next Level Apparel Introducing our new Made in the USA line by Next Level Apparel. The new line consists of your favorite tees in men's (3600A) and women's (3900A) cotton crew tees and men's Tri-Blend crew tee(6010A). You now have the freedom to choose a Made in the USA version of your favorite shirts worthy of your message or designs. Johnson Plastics Plus Booth #322 952-888-9507 www.jpplus.com The All-New Saddle Collection From rustic styling to urban chic, the new Saddle Collection line of leather-like products redefine simple, everyday comfort. Offered exclusively through Johnson Plastics Plus, the Saddle Collection is both laser engravable and UV-LED printable. Available in a wide range of gift and promotional items as well as 12" x 24" sheets, the Saddle Collection adds a whole new dimension to your product offering. 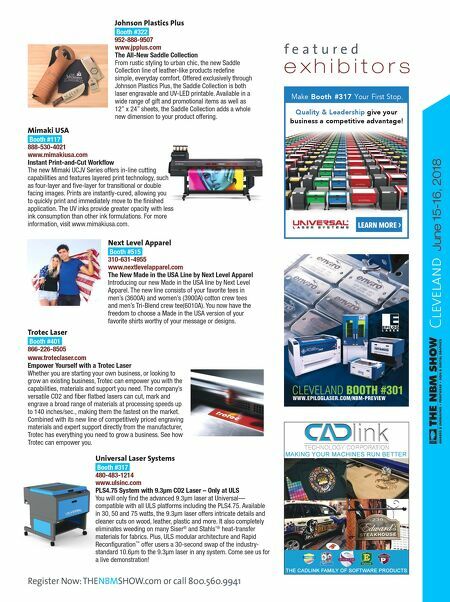 Register Now: THENBMSHOW.com or call 800.560.9941 Mimaki USA Booth #117 888-530-4021 www.mimakiusa.com Instant Print-and-Cut Workflow The new Mimaki UCJV Series offers in-line cutting capabilities and features layered print technology, such as four-layer and five-layer for transitional or double facing images. Prints are instantly-cured, allowing you to quickly print and immediately move to the finished application. The UV inks provide greater opacity with less ink consumption than other ink formulations. For more information, visit www.mimakiusa.com.